This year has been a very busy year for osprey rescues. However, not all rescues end in being admitted into the rehab facility. Occasionally our rescue calls result in an immediate re-release which was the case with one of the osprey calls we had this week. 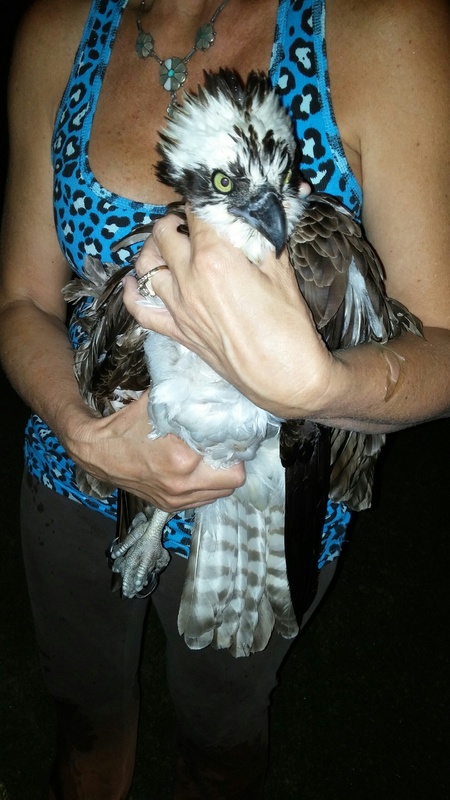 On Tuesday night we received a call from a concerned resident of Oldsmar who had found what appeared to be an osprey in danger. We were able to immediately dispatch a team to the area to access the situation. The caller stayed that the osprey was grounded on top of a fish and entangled in something near the side of the road. She had approached the osprey in hopes that it would relocate to a safer place but did not. Kim was the first to arrive and was able to catch and access the bird. She was in fact grounded and had some plant matter wrapped up in her talons too, but that is not what was keeping her down. This particular osprey’s eyes were bigger than her stomach! She had caught quite a large fish and had gotten it stuck on her talons. It is not completely uncommon for ospreys to get fish stuck on their talons and usually they are able to eat them off over a course of a few hours. They problem with this one was the location she had gone down. We were worried that if left to deal with the fish on her own she may be hit by a car. Luckily we were able to get the fish off and move her about 100 yards away to a clearing with her fish and re-release her after being examined for injuries. Fortunately this osprey was able to receive the help it needed quickly but not all wildlife is as lucky. If you happen to find an animal in trouble please make sure you report it to a licensed rescue facility like Owl’s Nest Sanctuary for Wildlife so that it can receive the care and treatment it needs. We also ask that you consider making a donation to Owl’s Nest Sanctuary for Wildlife so that we may continue our work. For more information about osprey visit our ‘Osprey’ post in the Education & Conservation section of our blog or click here. ← Tshirts, Tanks, Totes, & Decals Fundraiser!